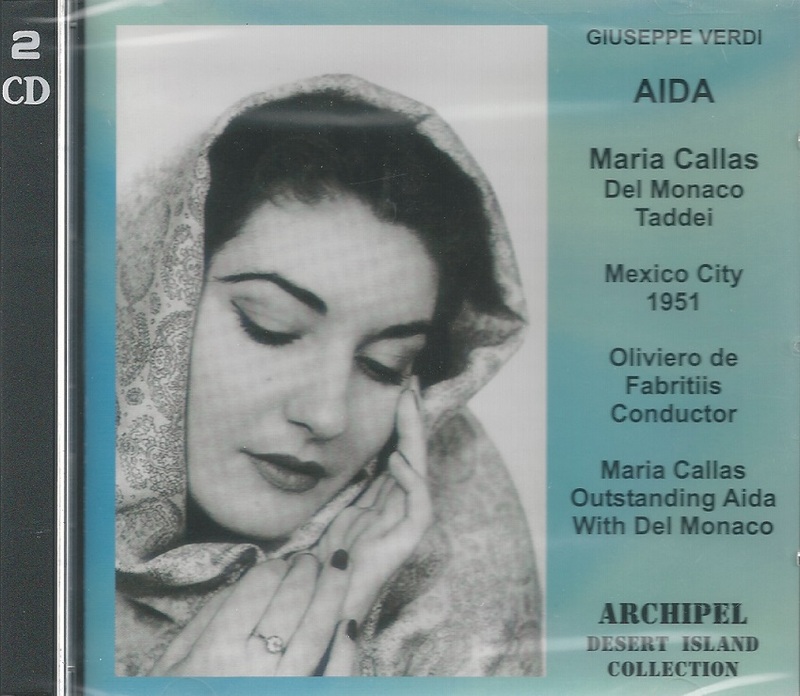 "Callas is in brighter voice in 1951, and while the flame of her singing burns no less intensely, it has taken on a further glow and steadiness, and she now includes the blue centre of the flame as well as its red edge. She is helped immeasurably by de Fabritiis, whose view of the score provides an expansive sound and approach in sympathy with Callas' musical ideas. She again includes the top E-flat at the conclusion of the Triumphal Scene - and if anything it is more rousing and epic than the year before." "It was always a given that del Monaco possessed a remarkably powerful, steady voice with unsurpassed brilliance and power. He was, however, often criticized for singing with little finesse, for using his power unrelentingly. That was never true (his many live broadcast recordings give even stronger evidence of his ability to sing with light and shade). I found myself thrilling to the sheer sound of the voice and to the commitment and passion with which he sang. What will surprise many is the variety of dynamics and color that the tenor did bring to his singing. It is easy for critics to comment on the method of a singer and to forget the most important element - the sound of the voice....His diction was a model of clarity and crispness, his intonation was almost always centered, and his rhythmic pulse was extremely strong. In many cases one listens to this kind of singing and longs for the days gone by when there were singers like this....old-timers...reminisce over one of the great operatic tenor voices to be heard in the 1950s and 60s, and younger listeners discover what a great 'tenore di forza' sounds like. We have nothing like him today." "Mario del Monaco was one of the most widely recorded singers of the 1950's and 60's and divided his busy operatic career between Europe and America during those years. Sir Rudolf Bing, then manager of the Metropolitan Opera, heard Mr. del Monaco's debut as Radames in Verdi's AIDA at the San Francisco Opera in 1950 and asked the tenor to stop in New York for a guest appearance at the Met in Puccini's MANON LESCAUT on his way back to Europe. Mr. del Monaco's singing made a distinct impression and won him a long and prosperous relationship with the Met beginning the next year. At the New York company from 1951 to 1959, he sang 102 times, in 16 roles. He appeared on the Met's tour 38 times. His last performance at the Met was as Canio in Leoncavallo's PAGLIACCI in 1959. But he returned three years later to Carnegie Hall in a concert of arias and duets with Gabriella Tucci. Indeed, when Mr. del Monaco was loved, it was for the brilliant, stentorian quality of his voice rather than for his subtlety of phrase or ability to act. And in a profession often peopled by overweight tenors, Mr. Del Monaco offered a classic profile and dark good looks that made him an attractive presence on stage. Mario del Monaco was born in Florence in 1915 and grew up in nearby Pesaro where his father was employed in city government. His parents were both musically inclined and encouraged his singing. Although he had some lessons, he was largely self-taught. Mr. del Monaco made his professional debut in Puccini's MADAMA BUTTERFLY in Milan in 1941. He spent the war years in the Italian Army. After the war, Mr. del Monaco's career blossomed and spread to Milan's La Scala and London's Covent Garden as well as opera houses in Rome, Naples, Barcelona, Lisbon and Stockholm. In 1946, he sang in Buenos Aires and Rio de Janeiro, moved northward to Mexico City and then on to San Francisco for his American debut. Mr. del Monaco's relationship with the Metropolitan Opera ended in 1959, reportedly by mutual consent, but he was recording until the end of the 1960's. In 1973, he joined a gathering of prominent tenors in Naples to honor Caruso's centenary and pres reports spoke of his 'personal glamour and still thrilling dynamism'. Mr. del Monaco retired to his villa near Venice later in 1973 and turned to teaching. Mr. del Monaco and his wife, Rina Fedora, a former singer, had two sons. One of them, Giancarlo, is now a stage director in Europe's opera world." "Oralia Dominguez is a Mexican mezzo-soprano who was active in the mid-20th century. She was born in Northwest Mexico in the town of San Luis Potosi and studied at the National Conservatory of Mexico where she made the acquaintance of the composer Carlos Chavez who championed her career. In 1951 she sang the role of Amneris in Aï¿½DA for the first time at the Palacio de Bellas Artes in Mexico City with Maria Callas, Mario del Monaco and Giuseppe Taddei under the direction of Italian conductor Oliviero De Fabritiis. 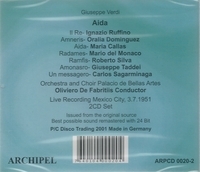 A recording of this performance has circulated since that time and is still regarded as one of the most exciting performances of this very popular opera on record. She made her European debut in 1953 at London's Wigmore Hall. That same year she appeared with the La Scala company performing Verdi's MANZONI REQUIEM at the Lucerne Festival. She recorded it the following year under the direction of Victor de Sabata. The following year she appeared throughout Europe with such conductors as Tullio Serafin, Igor Markevitch, Paul Kletzki and Herbert von Karajan. In 1955, she made her debut at the Royal Opera House, Covent Garden, singing in the world premiere of Michael Tippett's A MIDSUMMER'S MARRIAGE." 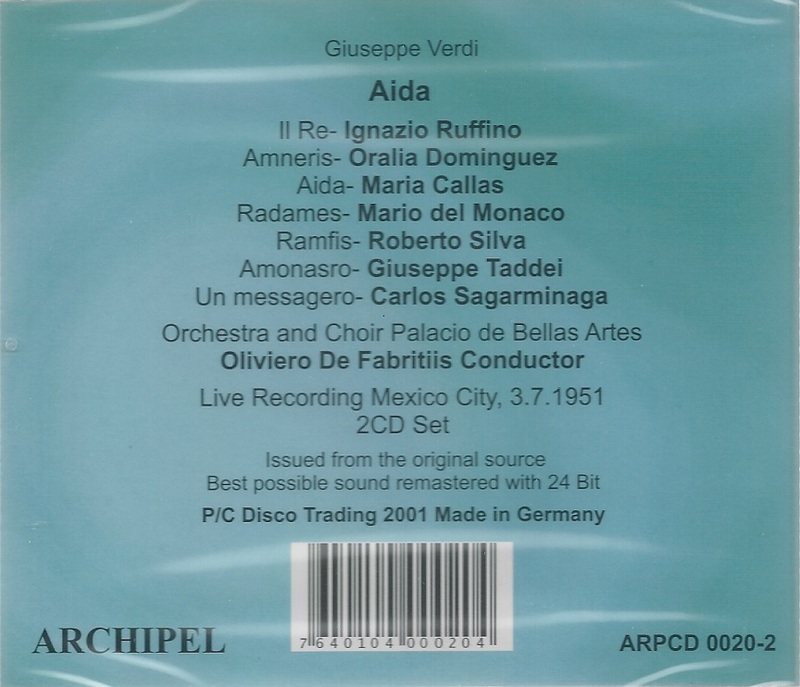 “Giuseppe Taddei was a distinguished Italian baritone who made his Metropolitan Opera début to glowing notices in 1985 at the astonishing age of 69. Born in Genoa on 26 June, 1916, Mr. Taddei made his operatic début in 1936, as the Herald in a production of Wagner’s LOHENGRIN in Rome. In the decades that followed he performed on many of the great opera stages of Europe, including those of the Vienna State Opera, La Scala and Covent Garden. In the 1950s, Mr. Taddei appeared in the United States with the San Francisco and Dallas Civic Operas; he was also long known to listeners here through his many recordings. In the 1960s, he sang in New York in concert performances. But until 25 Sept., 1985, when he stepped onto the stage at Lincoln Center in the title role of Verdi’s FALSTAFF, Mr. Taddei had never sung at the Met. At his curtain call, THE NEW YORK TIMES reported, Mr. Taddei received ‘a rafter-shaking ovation’. Opera exacts a great toll on the voice. Singers often retire in their 50's, at least from weightier fare. Appearing at a major opera house in one’s late 60s is highly unusual; making a début at that age, breathtakingly so. To do so to the kind of rapturous reviews Mr. Taddei received is almost beyond contemplation. What apparently stood Mr. Taddei in good stead was the Italian bel canto tradition — the lighter, less forceful style of singing in which he had been trained — which can let its practitioners extend their careers beyond the usual retirement age. In all, Mr. Taddei performed with the Met 21 times. Besides Falstaff, which he sang in 1985 and 1986, he appeared as Dr. Dulcamara in L’ELISIR D’AMORE in 1988. Reviewing Mr. Taddei’s Met début in The Times, Donal Henahan wrote: ‘His Falstaff, not only wittily acted and fully formed, was astonishingly well sung. The voice is not exactly plummy these days, but it retains a wonderfully liquid quality in lyric passages’.